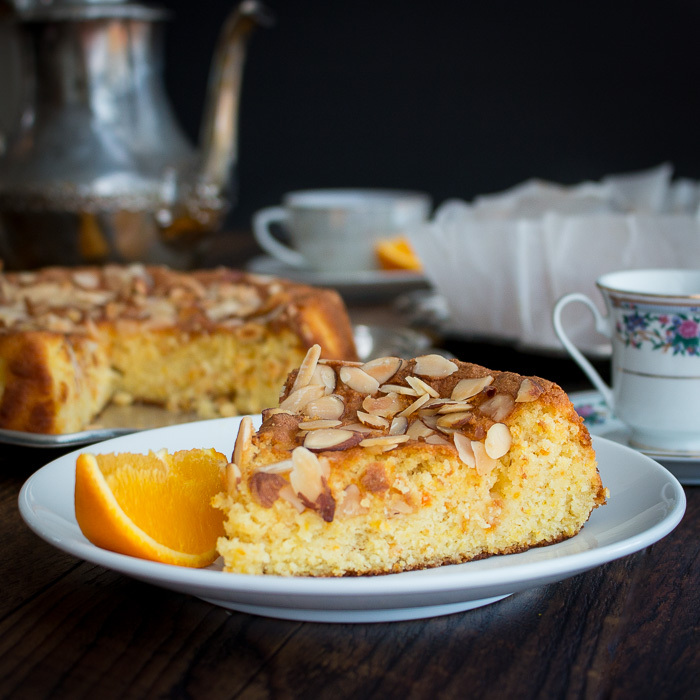 The Best Orange Almond Flourless Cake is a super moist, lightly sweet gluten-free Spanish cake made with whole oranges and orange peel. 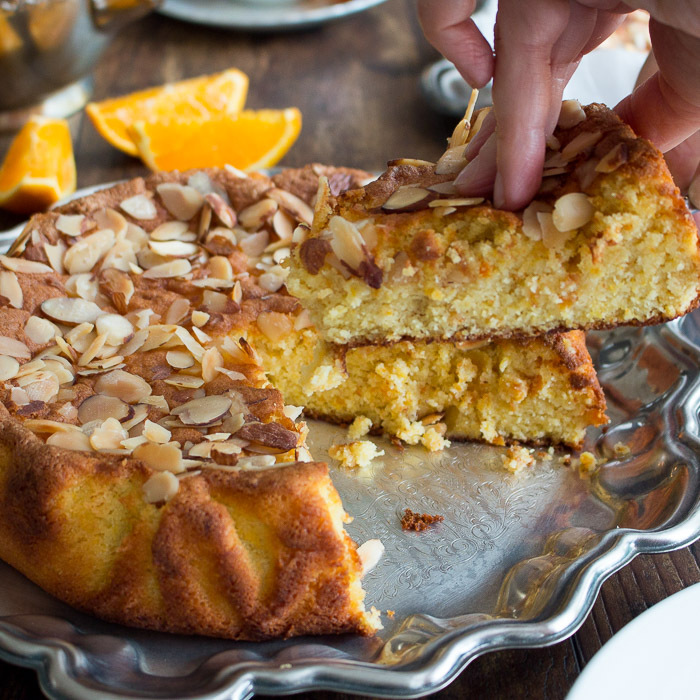 When you bite into our Best Orange Almond Flourless Cake, you are first going to love the fresh citrus aroma. Next, the crunch of the almonds and then the super moist decadent cake. This cake is a refreshing change as it is not too sweet, only lightly sweet but full of flavor. Can you believe it but there are only 5 ingredients to this cake? Really, only five little ingredients and you probably have them in your pantry right now. So, what are you waiting for? Let’s get baking! This last weekend we hosted a gathering with our friends and Spanish Tapas was our theme. We served empanadas, Spanish meatballs, stuffed mushrooms and had a massive cheese, meats and olive board for everyone to nibble on. Oh, and don’t forget about the Sangria’s! We had lots of those too. For dessert, we prepared our Best Orange Almond Flourless Cake for the birthday girl and it was inhaled. We are so glad we made 2 cakes as it is also fantastic with a cup of coffee or tea the next morning. When we were growing up Lemony Lemon cake was our absolute favorite cake in the world. Yep, we even love it more than chocolate. We know what you are thinking, how can citrus be better than chocolate. Citrus really involves all your senses, much like chocolate. We are all about texture, taste and aroma. These 3 traits for us either make or break a dessert. Heck if we are going to go all out and turn on the oven and bake, it better be darn fabulous. As you know, we are mostly a savory crew here but when we make desserts they need to take us on a culinary journey to another land. How many of you been to Spain? It needs to be on a culinary bucket tour for sure, right? We enjoy many Spanish Desserts like flans, rice puddings, Tarta de Santiago, special Spanish Cheesecakes, churros and many others. However, the problem with many of these desserts is that it should be made the day of and are difficult to serve to a crowd. 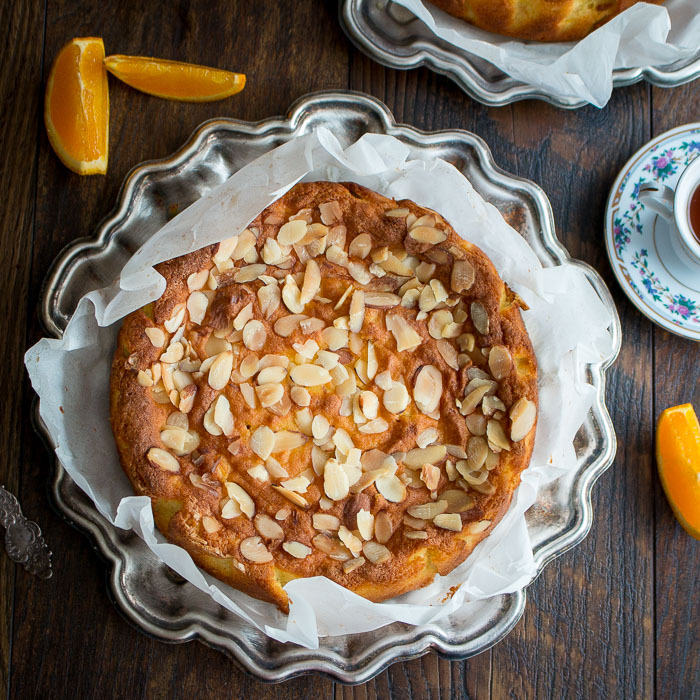 We wanted a something we could make the day before and would be perfectly portable for a tapas crowd and that is our Best Orange Almond Flourless Cake. 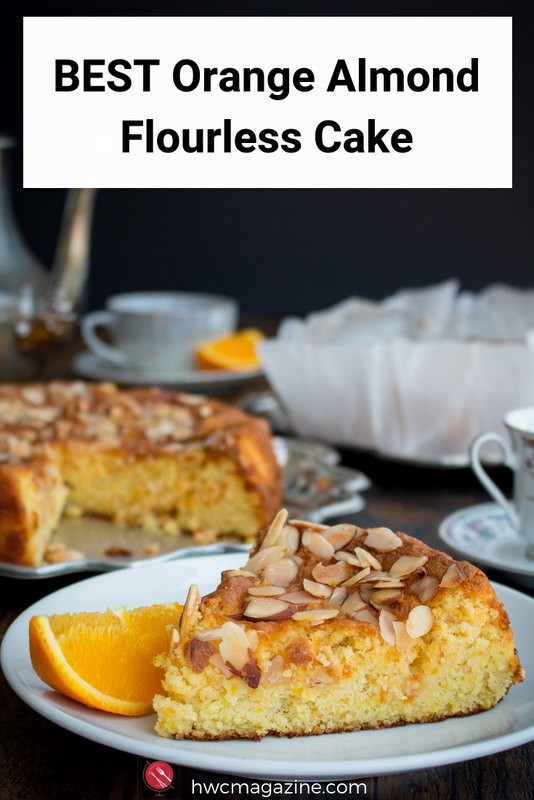 There are two very distinctive traits to this Best Orange Almond Flourless Cake that make it classic. First, you use the whole oranges. You simmer 2 whole oranges in a pan with water for about 45 minutes until the oranges are soft but still whole and intact. Alternatively, you can also cook your oranges in the microwave for 15 minutes to save time. However, we feel the stove top method produces the best results. We left our whole oranges cool overnight in the refrigerator and then the next day we peeled the oranges, scraped the white pith from the orange zest, removed any seeds and chopped up the oranges and orange zest as you will use both in this recipe. This takes a bit of time. However, the end result is so worth it. 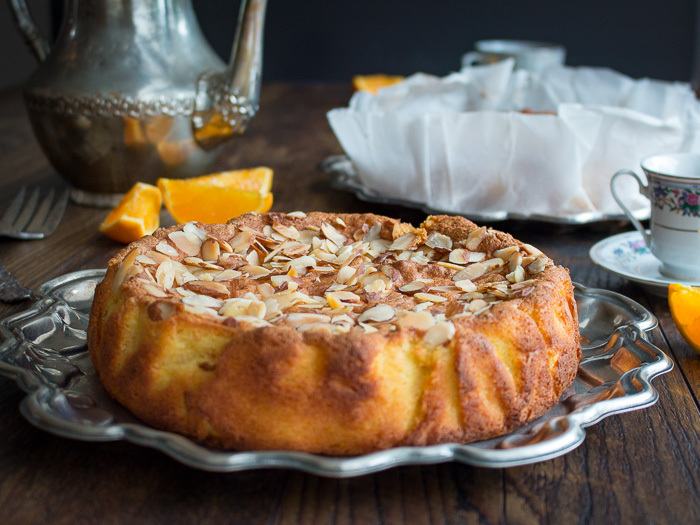 Secondly, this Best Orange Almond Flourless Cake has no flour. It is made only with ground almonds. We used the pre-ground almonds in the baking section to save time but you can also do this in your food processor. 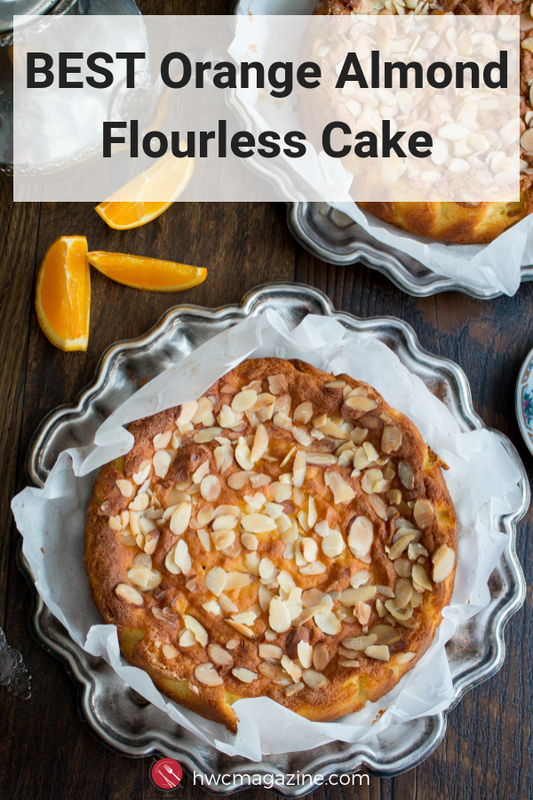 Flourless cake is fabulous option for our gluten-free friends. 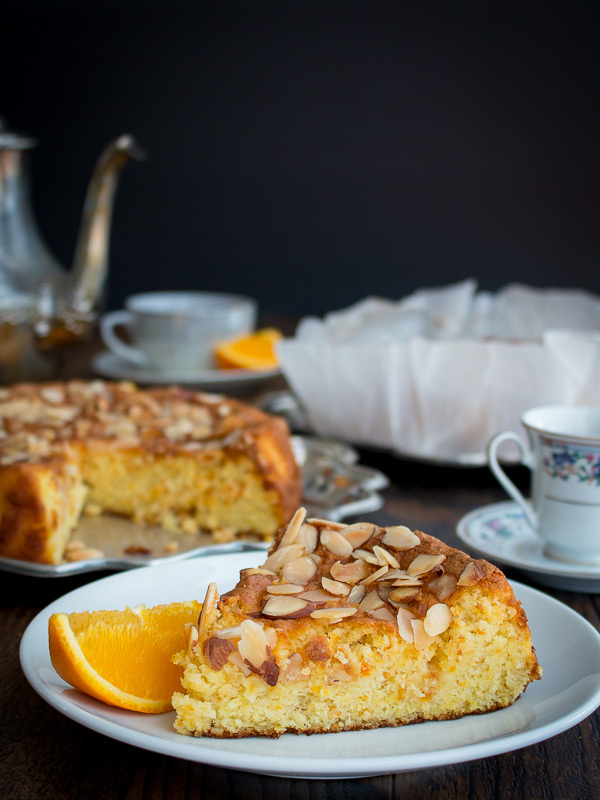 The Best Orange Almond Flourless Cake is a super moist, lightly sweet gluten-free Spanish cake made with whole oranges. 3Line your 9-inch baking pan with waxed paper/parchment paper. We used a spring form pan and it seemed to work well. However, a regular 9-inch cake pan is also okay as if you line your pan with the parchment paper. If you leave a little excess parchment paper at the top, you can just lift straight out of the pan. As a precautionary measure sprayed the parchment paper with a little spray oil. 5Prepare your oranges. Cut your cooked and cooled oranges in half. Peel your oranges. Keep the peel. Scrap and remove the white pith from the orange peel with a spoon delicately and discard the pith. Remove any seeds from the oranges. Remove any tough sections from the oranges and discard. Chop the flesh of the oranges and the orange peel of the oranges roughly with a knife. Place your cleaned and chopped oranges and orange peel into a food processer and blend until smooth. Alternatively chop finely with your knife. Set aside. 6Separate the egg whites from the egg yolks. Place your egg whites in a large bowl and whisk until stiff peaks. We used a blender but you can also do by hand. Add ½ of the granulated sugar mixture gradually while whisking for about 1-2 minutes or until the eggs turn shiny and glossy in color. 7In another large bowl. Whisk the egg yolks and the other half of the granulated sugar about 2 minutes until the mixture is light and fluffy in color and thicker in texture. Add the pureed orange mixture and the ground almonds and mix together. 8Slowly and gently, fold in the egg white mixture into the egg yolk, orange and almond mixture, just until mixed together. Do NOT beat or mix, but fold as you want to keep this cake light and airy. 9Pour the finished cake mixture into your prepared cake pans. Gently smooth over the top with a spatula and top with sliced almonds. 10Bake Best Orange Almond Flourless Cake for 20 minutes on the middle rack and then check on her. If your cake starts to get to brown before set then set a loose layer of aluminum foil over the top until finished baking. Reset timer for another 15 minutes and check on your cake. (We have an uneven oven that drives us crazy!!! We always must turn our items that are baking to assure our food bakes evenly on all sides) Your cake will take between 45-55 minutes to cook or until the toothpick comes out clean when placed in the center of the cake. Our cake cooked in about 45 minutes. Every oven is a little different. 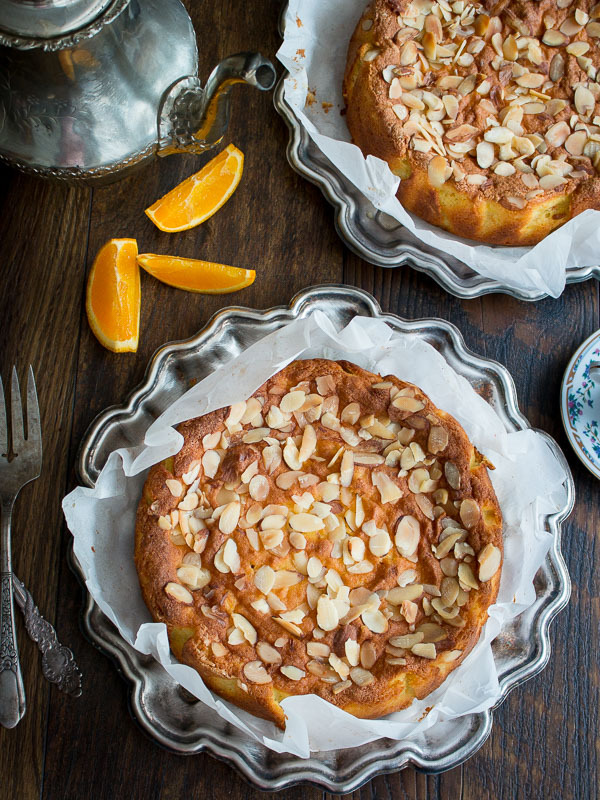 11Allow your Best Orange Almond Flourless Cake to cool in the pan. Remove from the pan using the sides of the parchment paper and spring form pan functionality. Carefully remove the parchment paper from the cake. Dust with a little powdered sugar before serving and enjoy. 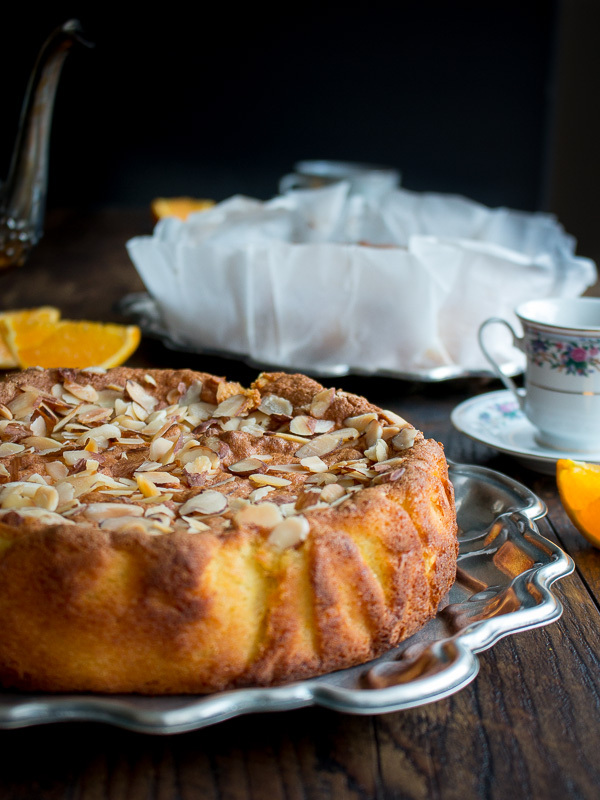 12You can store your Best Orange Almond Flourless Cake in a sealed container for a couple of days. We stored our cakes in a one gallon sealable baggie and it stayed super moist and fresh in the refrigerator. We enjoyed it the next day as a sweet breakfast treat with our coffee in the morning.